GodMode. The mere mention of the omnipotence-granting tweak should bring a smile to the face of veteran Windows tinkerers, and yes, the legendary hidden feature still works in the Windows 10 Preview. GodMode essentially unlocks a centralized table of contents for all of Windows’ far-flung features and customization options, drawing all your options together into a single interface and sorting them by tweak types. Once you’ve basked in its glory, you’ll be hooked for life. Be sure to include the period after “GodMode”! And while this hack is known as GodMode far and wide, you can actually name this folder whatever you’d like by altering the “GodMode” portion of the string. Hassle-Free PC columnist Ian Paul names his Jedi Mode, as he explained in his longer look at the feature. The GodMode icon and folder in Windows 10. Once you’re done and hit Enter, the icon should transform to mimic the Control Panel’s look. Open it to check out your customization options. You can move GodMode around your system the same way you would any other folder, if you don’t want it cluttering up your desktop. 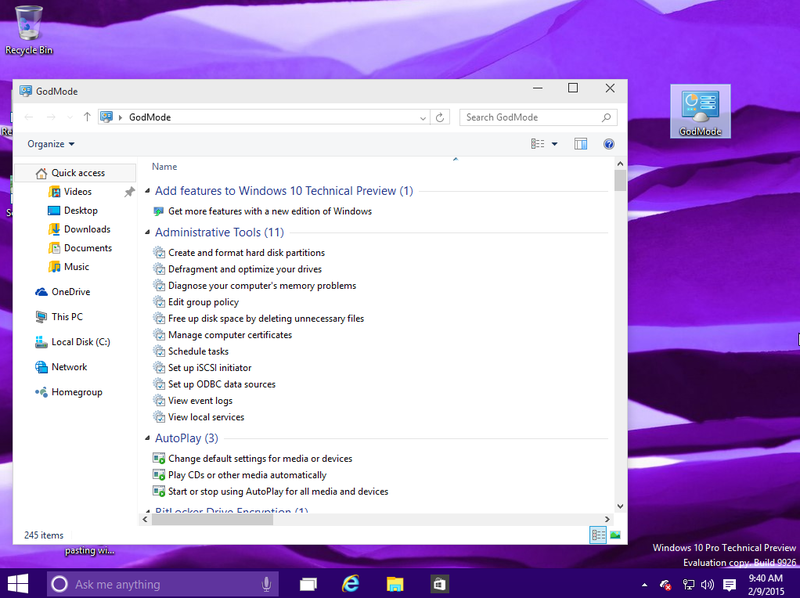 Be sure to check out PCWorld’s guide to Windows 10’s best tips and tricks when you’re done exploring GodMode. What’s that? You haven’t even tried the Windows 10 Preview out yet? Here’s everything you need to know to get started, and a guide to the killer new features you’ll want to check out first.